This is another one I picked up on tour in 2004. I remember running into Nedelle and Thom (by themselves, no backing band) at the Triple Rock Social Club in Minneapolis, where I stopped because I had a day off and wanted something to do. It was by conincidence that they were there as I was going to play with them the next day in Chicago, and I recall Jeff Hanson (also on Kill Rock Stars) headlined the show. 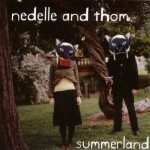 What I remember of Nadelle and Thom was that they were great performers. Thom’s guitar playing and singing were spot on and Nedelle sang perfectly; their harmonies were great. They were equally good the next night in Chicago, very impressive, blah, blah, &c.
In the end though they were playing what I would describe as lounge music, and while a number of the songs were very good and catchy (“Cute Things” in particular) it just wasn’t my thing. This CD reminds me of that, and the backing band makes it even more “loungy,” very 60’s variety show music. Nothing wrong with that, no doubt, but I guess the two have since gone their separate ways. On a separate note, regarding the previous night at the Triple Rock in Minneapolis. That was the second time I’d seen Jeff Hanson — a friend had invited me to go see him the year before at Studio Seven in Seattle. At both shows I was shocked by his voice, which sounded very much female. To observe that voice coming from a gruff-looking man was a weird thing, and he took advantage of its effect in his songwriting, which was haunting. He had a sense of humor about it too, I recall him joking at the Triple Rock show, asking the sound guy if his mic sounded high to him. Sadly, Jeff Hanson died in 2009 in St. Paul.